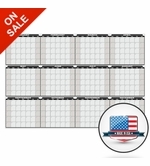 Full year dry erase calendars are the ultimate in yearly scheduling. Being able to view an entire year of events and projects is a great help to budgeting resources. 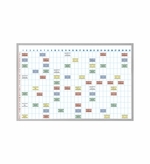 These are also popular tool for company or department vacation planning. 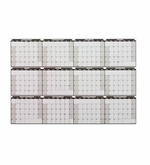 Whatever your needs, know that know that you're getting a high quality dry erase board made here in the US. 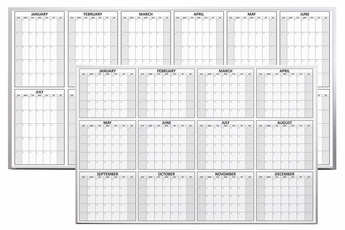 We use our premium OptiPrint™ dry erase surface across our entire line of calendars. 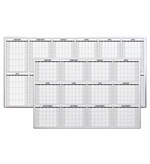 The OptiPrint writing surface locks high resolution graphics under a premium dry erase surface. Our yearly calendars have individual day boxes for the entire year. Choose between magnetic, economy or peel & stick decals. 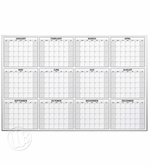 We also provide you the option to make a Custom designed dry erase calendar. 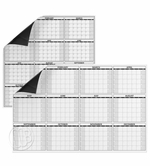 We're always happy to add a company logo or make a calendar with your own design. NEW ! 2019 Year Calendar.